One word comes to mind when describing Michael Franti’s shoeless performance on Monday night at the Calvin Theater: Energy. Franti and his band Spearhead electrified Northampton this week, performing two shows on Monday and Tuesday to a positive audience that was all about having a good time to his soulful and fun-loving lyrics. After a strong opening set from British folk singer Bobby Long, Franti took the stage at Noho’s small venue shortly after 9:15 p.m. to thunderous applause. Long is known most notably for his tune “Let Me Sign” which is featured on the “Twilight” soundtrack and his supporting band, the Kalob Griffin Band, just signed with ALO Records and will support Franti for the remainder of his fall tour. The band started with a track off of Franti’s new album, “The Sound of Sunshine” with “The Thing That Helps Me Get Through,” a song that directly mirrors the first lyrics of the tune, “rock and roll with a whole soul.” Franti’s jovial way was on display early and often throughout the entire performance, getting the crowd into the music from the very beginning. From there, Franti flirted with his reggae roots with a much more up-tempo version of “Rude Boys Back in Town” off of 2008’s “Real Rebel Rockers.” The EP was recorded mostly in Kingston, Jamaica and is one of Franti’s more reggae-infused albums. Next was another track off of Sunshine, “Only Thing Missing Was You,” which started from fiery guitar licks from Franti’s supporting strummers, Dave Shul and Jay Bowman, who were active all night long with bassist Carl Young. The song also taps into Franti’s reggae sentiment, but not heavily and was executed perfectively. He then took the time to share with the audience how great a day he had, “going for a run through the Smith College campus,” and “how he loved Massachusetts this time of year,” which received thunderous applause. 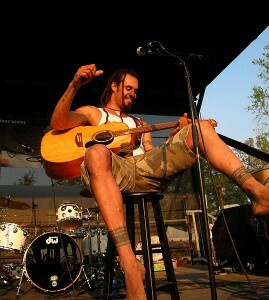 After these few songs, Franti tapped into his political bravado with the multilingual, “Hello, Bonjour,” from 2004’s “Yell Fire.” The album was recorded after Franti visited the war zones of the Middle East and Iraq, as Franti has been an outspoken advocate for peace not only through his lyrics in his music but by his constant humanitarian efforts. As Franti shouted hello in a number of different languages, the crowd echoed, which was pretty exhilarating. Franti’s tone switched from multicultural to friendly, with the whistling “Anytime You Need Me,” which suffered from a generic chorus and basic sound. With a bass-laden “Everyone Deserves Music” by Young, Shul and Bowman, Franti played the acoustic “Hey World (Don’t Give Up Version)” with percussionist Manas Itiene playing a djembe, an African drum. Franti returned to his governmental issues in this soulful song which was better with Itiene sitting in. Franti decided to just walk through the crowd singing “Yell Fire!” off the self-titled LP and shaking hands with people. After a “Smell’s like Teen Spirit” tease, Franti walked up into the balcony and had a young boy direct “Hey, Hey, Hey” which really got the crowd into the concert. With another congratulatory shout-out to the San Francisco Giants, who had won the World Series during Franti’s set, the San Francisco native went acoustic and started “I Got Love For You,” a song that he wrote for his son, which prompted an “ole” chant. Franti’s crowd interaction continued, as he talked about his adoption and how he met with a local Northampton adoption agency that day and closed the set with his most popular tune, “Say Hey (I Love You).” He invited people under the age of 10 and over the age of 60 to join him onstage for the encore, as 15 people danced the night away. Franti’s performance was a mix of reggae, rock and soul added with fun-loving and smart lyrics that don’t only make people happy but engaged about the state of the world. Above all, it provided the audience with a positive and interactive energy that cannot be replicated by other performers.